Himalayan Salt Lamp USB, Multi Color (Evolution Salt Co.) - Penn Herb Co. Ltd. 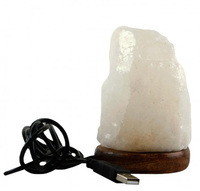 The color changing USB Salt Lamp is truly unique with a white Himalayan salt crystal that changes colors when plugged in to a computer or USB adapter. Place in the bedroom, at the office, by your computer, next to your television, or anywhere a USB port is available. Note: USP adapter not included. Salt lamps have hygroscopic properties meaning the lamp easily absorbs moisture. It should not be sprinkled with water or kept outdoors. If it becomes moist, simply wipe it down with a cloth.